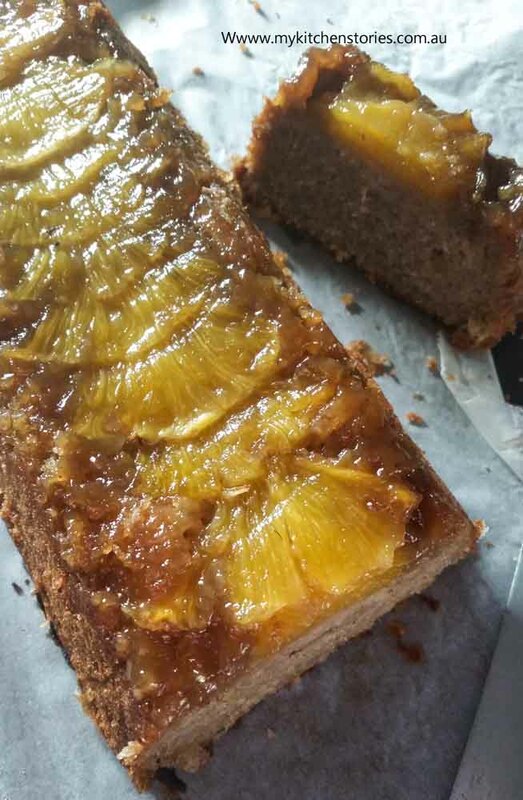 Yes, Pineapple shines in this Sticky Pineapple loaf. Pin it for later!! This Sticky Pineapple Loaf is going to make you fall in love. Pineapple makes such an amazing dessert when it teams up with caramel. You won’t need a mixer and you won’t need an ice cream machine, but you will need to call everyone to the table for dessert, because it’s on! Make a Sticky Pineapple Loaf anytime. You can make this any time of the year but in the spring Pineapples are at their sweetest, most perfect. I love my job, because each season when the fruit is at it’s best I get sent some to make a recipe or two with. Recipes this year for Bananas, Persimmons, and amazing local Blood Oranges are some of my favourites. I just love coming up with recipes. I also get sent some seasonal fruits and vegetables so that I can help to remind you (and me!) they are in season. Here in Australia we are lucky to have a temperate climate so we don’t always think seasonally. We are so used to getting all kinds of fruit and vegetables year round, that we are very spoilt. But the truth is all fruit and vegetables have seasonal fluctuations and taste better at certain times. Come on down Pineapples, it’s your turn. I know that everyone has a favourite recipe for Banana Bread. 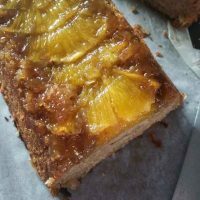 Believe it or not this Sticky Pineapple Loaf also features bananas and it takes the cake!. Literally. Now this is a dessert to rival any caramel sticky pudding you have ever had. The ice cream couldn’t be simpler and I am sure you’ll find some fans for it in your house. So this week has been hot then cold then hot, Mother nature can’t make up here mind. Is it summer or winter where you are?. To be honest it probably doesn’t really matter because this is a dessert that will last. 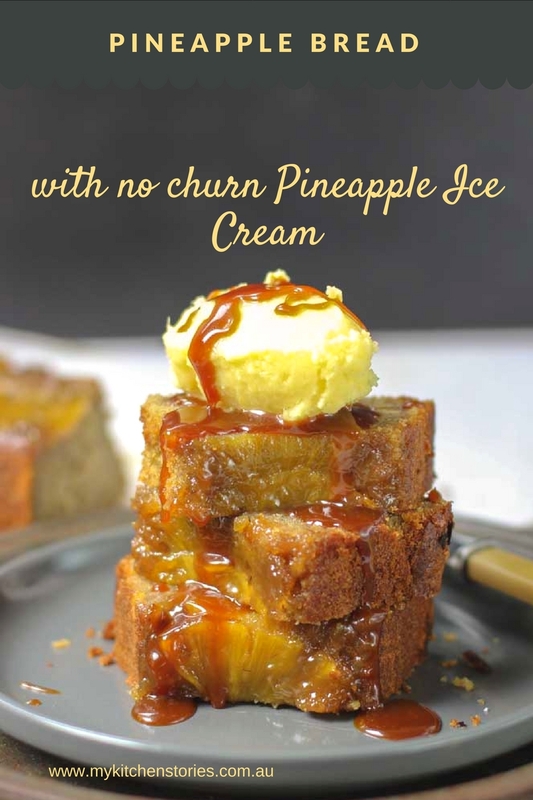 When the need takes you , slice off a couple of pieces of Sticky Pineapple Loaf, warm it with some caramel sauce and dig out a big spoon of Pineapple no churn ice cream. Ahem………I did. Sadly it was gone in no time. This is kind of tropical but a whole lot sticky caramel heaven. Oh stop it just make it and be done with it, its very very delicious. Set the oven to 180C Once the tins are lined spread each with brown sugar and line with pieces of thinly sliced pineapple. In another bowl mix the flour, salt, cinnamon, baking soda. Add the flour mixture to the liquid mixture and stir till only just mixed together. Over mixing can make the bread tough. Pour the mixture into two tins. Bake for 60 to 65 minutes or until a skewer comes out clean when inserted into the middle. Cool on a rack for around 5-10 minutes. Don't cool completely. Run a knife around the tin to loosen and then turn out onto a papered rack. Gently remove the paper using a knife to loosen the caramel as you remove the paper. Put the frozen pieces of pineapple into the food processor with the condensed milk. Process till smooth. Freeze. This will stay easy to scoop with just a time out of the freezer. Serve slices of cake with caramel sauce and ice cream. Yes its a bit over the top but it tastes good! Yes. sugar happens. I would love to see what you would make with them Angie. Oh now that looks good! Hi Liz. Want just a teensy slice? How incredibly delicious. I wish I could pluck some out of the screen! Thanks Kari. Hope Motherhood is treating you well. Well this is all sorts of amazing! I’m surrounded by pineapples up here and so it would be the perfect dessert to make!! We just have hot and hotter here!! Thanks so much for sharing this with YWF too. This sounds right up my alley. Pineapple + brown sugar = guaranteed lusciousness! What size loaf pans, plz?